Jaromir Jagr did his thing on Friday night -- seven shot attempts, four shots on goal. I think we're seeing that he's not too old and he will, indeed, be a contributing member of this Flames line-up this season. But the highlights beyond that were few and far between as Calgary got ripped 6-0 by the Ottawa Senators, who did what they do, sat back, waited for mistakes and then didn't miss on an opportunity to capitalize or "counter-punch" as the Flames referred to it afterwards. While there's a few observations from the club's listless effort in today's eight thoughts, I'll also use this space to touch on other developments around the organization including some Flames prospects that are off to outstanding starts to their season. It's been quite the start to Matthew Phillips' season. The 19-year-old Flames prospect and Calgary kid, who the Flames drafted in the sixth round in 2016, has points in all nine games for Victoria. Over that span, he's racked up 22 points (7 goals, 15 assists) and he is tied with Swift Current's Tyler Steenbergen (16-6-22) for the WHL scoring lead. Steenberger, from Sylvan Lake, Alberta, was a fifth round pick of the Arizona Coyotes in the 2017 NHL Draft. In his first two years in the WHL with the Royals, Phillips' points-per-game climbed from 1.06 as a rookie in 2015-16 (37-39-76 in 72 gm) to 1.29 last season (50-40-90 in 70 gm). This year, he's at a staggering 2.44 points per game. This pace will obviously be impossible to maintain but still, he surely has the decision-makers at Hockey Canada taking notice. Phillips attended the World Junior Summer Showcase in August so you know he's already on their radar. If he keeps tearing it up like this, they will have little choice but to name him to this year's U20 team for the WJC that will be held in Buffalo over the Christmas holidays. 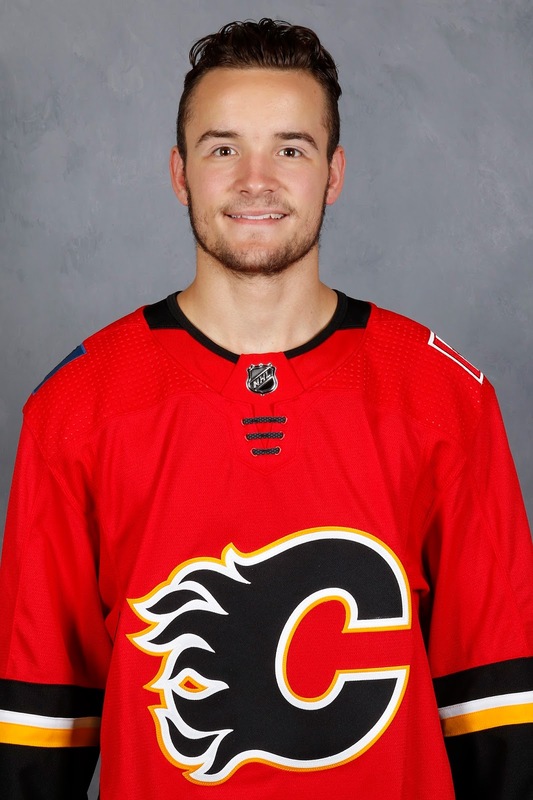 Speaking of Team Canada, Phillips' buddy Dillon Dube, the Flames second round pick in 2016, is expected to be on that team as he had an impactful tournament a year ago as an 18-year-old. Dube, who stuck around Calgary's main camp longer than many expected thanks to a strong preseason, is averaging just under two points per game so far. He has nine points (3 goals, 6 assists) in his first five games with Kelowna. Two more goals for #Flames prospect Matthew Phillips on Saturday. Is off to a sizzling start - 24 pts (9 g, 15 a) in 10 gm, 2nd most in CHL. 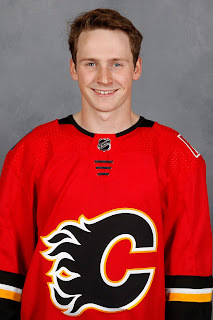 Meanwhile, off to a similarly stellar start to the season is big centre Adam Ruzicka, who some draft prognosticators had going potentially as high as the second round, but who Calgary was able to get in the fourth round in last year's draft. The big 6-foot-4 Slovakian playing in his second year with Sarnia (OHL) is off to a blazing start with 14 points (8 goals, 6 assists) over his first eight games. He is tied with overager Aaron Luchuk of Windsor and top 2018 draft prospect Andrei Svechnikov. However, having played one less game, Ruzicka is technically at the top. Pretty impressive stuff so far. The Flames depth at centre is well documented with Mark Jankowski still awaiting his chance but the depth chart falls off after that. 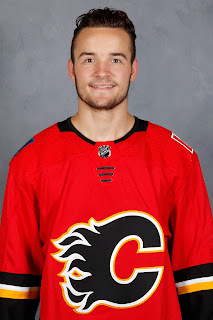 Ruzicka looks like he will slot in nicely as the next in line up the middle of the further-out prospects and he's a guy that could be a candidate to play up the middle in Calgary 3-4 years down the road. The rash of penalties on the Flames on Friday night -- seven times shorthanded compared to just twice for Ottawa -- left coach Glen Gulutzan a bit confused on what's being called and what's not. "I thought the rules have been flip-flopping a little bit," said the Flames coach. "Tonight, you saw the same standard as the preseason, but not since is what we saw in the first four games of the year. We've got to get back to adjusting to that standard." Coming into the year, the big crackdown was going to be on slashing and on face-off violations. Two of the Flames penalties Friday were for slashing and one was for a face-off violation. A double-minor on Mikael Backlund, a slashing penalty on Dougie Hamilton and a hooking penalty on Jagr left Calgary shorthanded for eight nearly-continuous minutes. "When one team is down three or four (opportunities), it amps up the frustration," admitted Gulutzan. 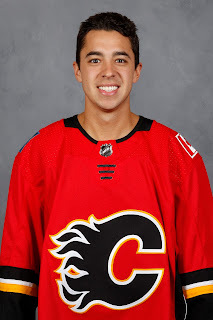 The result was Calgary's most dynamic player, Johnny Gaudreau, ended up stapled to the bench for a long, long time. From just past the five minute mark of the second period until the second minute of the third, Gaudreau only had two shifts -- both on the power play. His ice time at the end of the night was just 16:31. The last four games in which he's been held to under 17 minutes of ice, Gaudreau has failed to pick up a point. He's a guy that needs to keep his legs moving and needs to stay involved in the game. In short, nothing good happens from taking too many penalties. Your best player as mentioned ends up sitting, your lines get all messed up, you're giving up a ton of chances, which is wearing down your goaltender and your defence. Even if you don't get scored on during those man advantages, momentum swings in favour of the opponent and often goals against will come shortly after, which was the case on Friday. Calgary is eighth in the NHL in number of times shorthanded. Conspiracy theorists can't blame the so-called Wideman effect this year. It's on the players to be more disciplined, it's as simple as that. If you didn't watch the game, you are probably far more worried about what happened to Mike Smith than you should be. While the optics of surrendering five goals on 22 shots and then getting the unceremonious hook is certainly not great, but there were no goals in that batch that I would classify as bad goals. To me, a bad goal is that groaner type of softie that has been frequent over the past few years. Dribblers through the pads, goals leaking in from a sharp angle. In fact, I don't think Smith has allowed a so-called bad goal all season. Were there a couple on Friday that knowing the competitive guy he is, he thinks he should have stopped? Absolutely. But the Senators deserve some credit too for their execution. After both Michael Stone and then Matt Bartkowski committed to players coming down the sideboards, Cody Ceci ends up getting the puck all alone while flying down the ice at top speed and he scores on a slick deke to his backhand. Derrick Brassard with a blast inside the far post with Alex Burrows completely blocking Smith's view for what was essentially a power play goal, coming the second that Hamilton stepped back on the ice. Hard to stop what you can't see, especially when they're going bar-in. Mike Hoffman ripping a bar-down one-timer on a feed from Ceci for a power play goal. Smith kicks out his pad to deny Mark Borowiecki from 25 feet out, but Mark Stone is not picked up by anybody as he wanders through the slot and he buries the rebound. Ryan Dzingel finishes off a tic-tac-toe passing play by one-timing Thomas Chabot's cross-ice pass off Smith's arm and in. The fifth goal was one he probably could have had, but it was a bang-bang play in which Smith had to get across the crease. It was hardly one that made you shake your head. So while Smith's save percentage took a major hit, dropping from .950 to .928, the high level at which he's played should not be tarnished that badly. While the quantity of shots wasn't there, the quality was much higher on this night. Having not played since last Saturday, Stockton is finally back in action tonight. 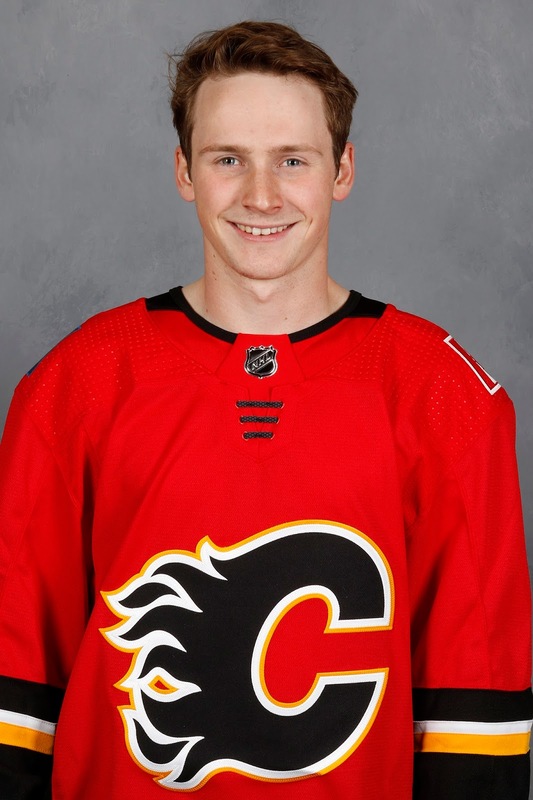 Calgary's American Hockey League affiliate is hosting the Grand Rapids Griffins led by former Flames prospect Turner Elson, who is the early-season AHL scoring leader with seven points (3 goals, 4 assists) in three games. The Heat will be busier this week with their next outing a road game in San Jose on Wednesday before returning home for back-to-back games against San Diego on Friday and Saturday. All eyes will continue to be on the top line of Jankowski (3-1-4), Garnet Hathaway (2-2-4) and Andrew Mangiapane (2-2-4), who combined for 12 points in Stockton's opening two games. Jankowski leads the team with 10 shots on goal and if he can continue to push for NHL employment like he has through the NHL preseason and now into the AHL regular season, you sense a promotion could come sooner than later, especially if the Flames keep scuffling along with inconsistent efforts. Now that the Honda Center curse has been lifted, that got me thinking what's the new curse? Well, Calgary has never won in Las Vegas. Mind you, their first trip to the T-Mobile Arena isn't until Feb. 21. Turns out, Madison Square Garden is now the rink in which the Flames have gone the longest without winning. Calgary has gone 0-4-1 in its last five road games against the New York Rangers since last beating them at MSG on Dec. 7, 2008. They will get a chance to end that skid on Feb. 9. The Flames have also love five straight -- all in regulation -- at the Air Canada Centre since last tasting victory in Toronto on Jan. 15, 2011. The Flames travel to Ontario to take on the Maple Leafs on Dec. 6. On behalf of the entire Calgary media, it will be a relief to not write about the streak any more. That storyline got boring several years ago. The last few years have been tedious. In case you missed this the other day, wins in Anaheim and Los Angeles on the same road trip was the first Southern California sweep for Calgary in over 23 years. Pretty stunning if you think about it, especially considering how often they play down there. The only other time the Flames had headed out on the road and beat both the Ducks and the Kings in their home rinks was in 1993-94. On Feb. 2, 1994, in Calgary's first ever visit to Anaheim -- the rink was known back then as the Arrowhead Pond -- they won 4-2. They followed that up with a 5-4 overtime win on Feb. 5 in Los Angeles, who were playing out of the old Forum back then. To give you a sense of how long ago that was, the Kings tied the game with two minutes left on a goal by Wayne Gretzky. Calgary won it in overtime when Al MacInnis put a shot past Kelly Hrudey. Friday night was opening night in the ECHL, which is now only known by those four letters. Still referred too quite often and mistakenly as the East Coast league, the league's name was changed to just ECHL from East Coast Hockey League on May 19, 2003 to reflect its growing geographic reach beyond the East Coast. This is notable for Flames fans as the Kansas City Mavericks, the new ECHL affiliate for the Flames features a goaltending tandem of Tyler Parsons and Mason McDonald, who are both Calgary property. In the off-season, the Mavericks had signed goaltender Ty Rimmer to an ECHL deal, but last Sunday, he was traded to Greenville, leaving Kansas City with just the two Calgary draft picks in their crease. While the ECHL is not the perfect spot for a top prospect like Parsons, it was time for him to graduate from the OHL as returning for an overage season in a league in which he had accomplished all he could do would not have been any better. What makes the ECHL a palatable spot is it's where Parsons can get starts and playing time -- Kansas City plays a 72-game regular season -- is the most important thing for the 20-year-old. It was a great debut for Parsons too as he made 39 saves to backstop Kansas City to a 5-3 win in, despite being outshot 42-25. An advantage of turning pro is now the Flames development staff along with goaltending coach Jordan Sigalet can be a lot more hands-on with him. With Lack only having one year left, I fully expect either Jon Gillies or David Rittich to ascend to the NHL as the back-up next season and that will open up at least one spot in the AHL. Each made one start in the preseason with McDonald stopping 29 of 30 shots in a win and Parsons allowing three goals on 32 shots in a loss. I fully expect Parsons to get a bulk of the playing time but it would be beneficial for all involved if McDonald, in his second pro season, pushed him much like how Rittich pushed Gillies last year in the AHL. So for those worried about Parsons' development, don't be. He'll be just fine. Since you mentioned Jankowski pushing for a spot on the big team, I want to say that I think Stajan has looked pretty good so far this season and is not going to make it easy for him if he keeps playing like he has been. Assuming of course that 18 would be the odd man out. Odd man roster-wise should be Hamilton and I'd expect Lazar, Stajan, Glass to take turns sitting. But that's just my perspective. Also since you gave the breakdown of all the Smith goals I think it's only fair to say that Lack looked shaky for the bit he played. There may have been a chance to start in Vancouver on the table that he blew imo. Lack will get his turn but may take a while yet. Then we'll see what he does with it. Rittich coming off a shutout in Stockton in his first AHL start. Lack needs to play well off the hop because otherwise, his money is easily buried in the minors.